Color can only exist when three components are present: a viewer, an object, and light. Although pure white light is perceived as colorless, it actually contains all colors in the visible spectrum. When white light hits an object, it selectively blocks some colors and reflects others; only the reflected colors contribute to the viewer's perception of color. The human eye senses this spectrum using a combination of rod and cone cells for vision. Rod cells are better for low-light vision, but can only sense the intensity of light, whereas while cone cells can also discern color, they function best in bright light. Three types of cone cells exist in your eye, with each being more sensitive to either short (S), medium (M), or long (L) wavelength light. The set of signals possible at all three cone cells describes the range of colors we can see with our eyes. The diagram below illustrates the relative sensitivity of each type of cell for the entire visible spectrum. These curves are often also referred to as the "tristimulus functions." Raw data courtesy of the Colour and Vision Research Laboratories (CVRL), UCL. Note how each type of cell does not just sense one color, but instead has varying degrees of sensitivity across a broad range of wavelengths. Move your mouse over "luminosity" to see which colors contribute the most towards our perception of brightness. 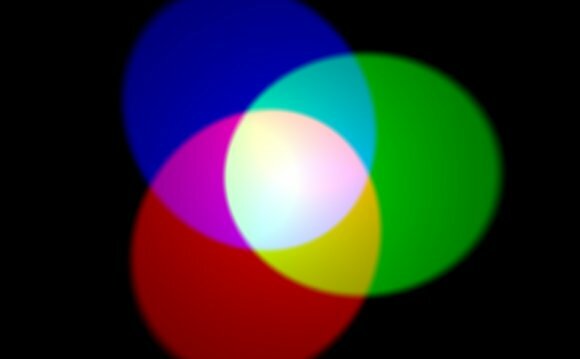 Also note how human color perception is most sensitive to light in the yellow-green region of the spectrum; this is utilized by the bayer array in modern digital cameras.